The summer fireworks festivals, or hanabi (lit. fire flowers), originally meant to scare away evil spirits and are a major part of Japanese culture, not to be missed when you visit Japan. The Nagaoka Fireworks are held annually along the banks of the Shinano River over two nights in August and the finale covers about two kilometers of the river, the widest span of fireworks in the world! Getting a seat for this event is not easy. 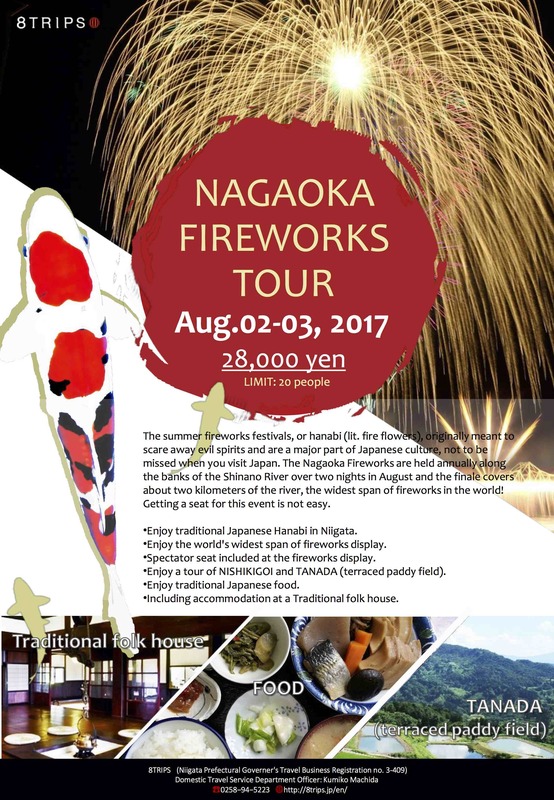 •Enjoy traditional Japanese Hanabi in Niigata. •Enjoy the world’s widest span of fireworks display. •Spectator seat included at the fireworks display. 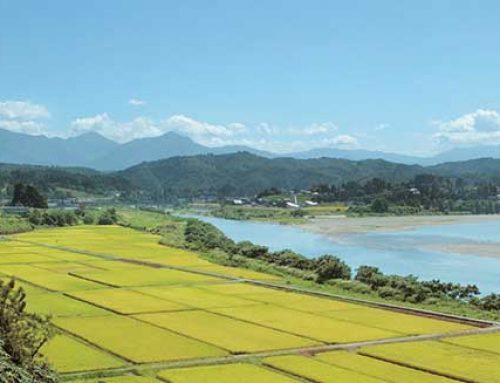 •Enjoy a tour of NISHIKIGOI and TANADA (terraced paddy field). •Including accommodation at a traditional Japanese house. The Nagaoka area in Niigata Prefecture, facing the Sea of Japan, has unusually heavy snowfall even compared with other places around the world. Located in the basin of the ShinanoRiver, this is a region famous for its prosperous rice cultivation and production of Japanese rice wine. The area is also renowned for its traditional culture, such as the NISHIKIGOI and TANADA (terraced paddy field), and the Nagaoka Festival (including the Nagaoka Fireworks Display held at the beginning of August). *Please note that in circumstances deemed necessary and appropriate by the program operators, adjustments to the itinerary listed above may be made without prior notice. 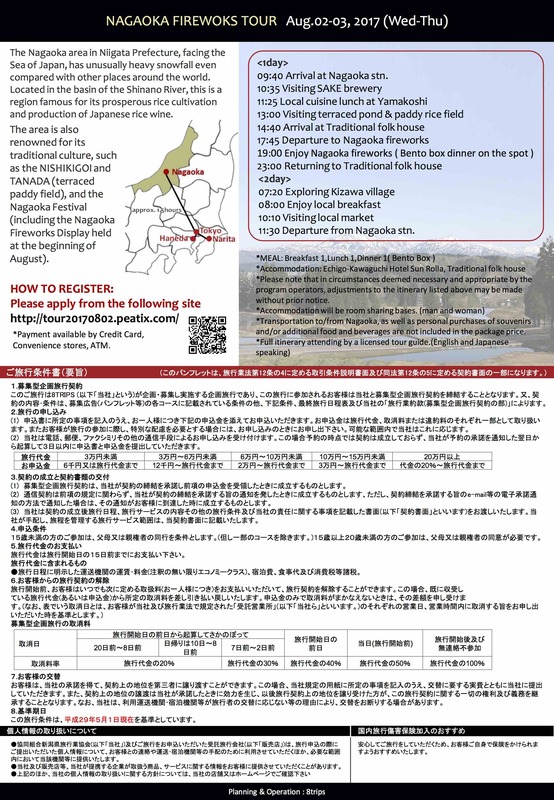 *Transportation to/from Nagaoka,as well as personal purchases of souvenirs and/or additional food and beverages are not included in the package price. *Payment available by Credit Card, Convenience stores, ATM.